Almond production in the county was about $172,030,000 for 2004. 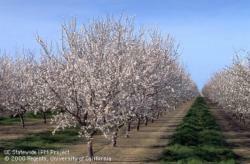 There are approximately 43,000 acres of almond orchards, primarily in the south county area. There are about 450 almond operations of which almost all are family farms. The most prominent project of the UCCE almond program is the Almond Regional Variety Trial located at the San Joaquin Delta College student farm in Manteca. This collaborative Cooperative Extension field trial is financially supported by the Almond Board of California and hosted by San Joaquin Delta College. It is one of three important sites in a statewide project, where 30 new varieties are being evaluated for production, quality and pest resistance characteristics compared with the California industry standard varieties of Nonpareil and Mission.